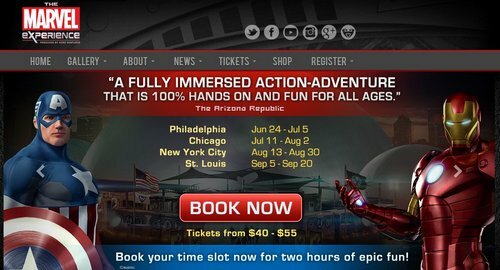 I hope you weren't waiting for The Marvel Experience to come to your town! The high-tech immersive Marvel road show, that was created by the same people who put together the tragically ill-fated play, Spider-Man: Turn Off the Dark, produced this road show that brought 360-degree projections, holograms and a 4-D motion ride. It was on the road and tickets have been bought, but the Philadelphia stop, its first of the tour, will be its only stop. "The Marvel Experience" tour was cancelled without any notice or explanation what so ever as to why. Though looking at the website right now, there's no inkling or clue that it has been pulled.